Rep. John Dingell (D-MI) at a ceremony honoring his service. 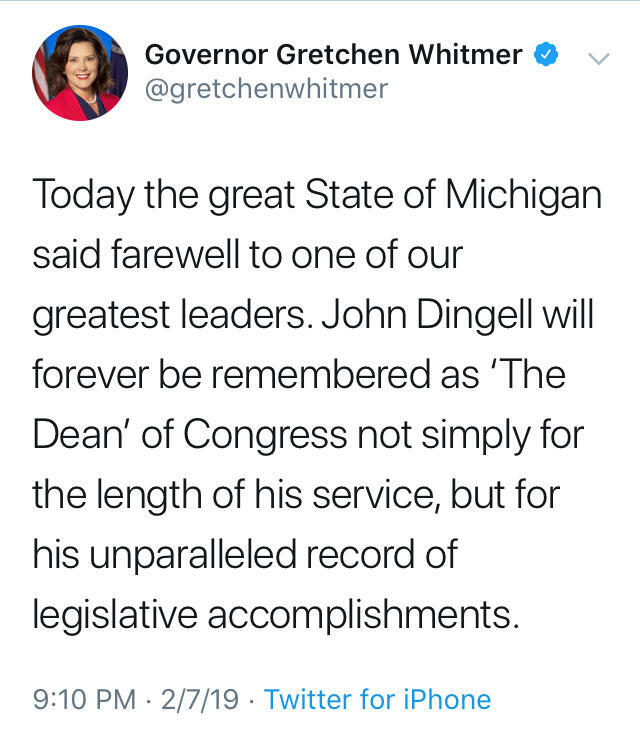 Sen. Debbie Stabenow (D-MI) tweeted "John D. Dingell – true Michigan and American legend, the Dean of the House and my longtime friend. We have been incredibly lucky to have you and will miss you dearly." 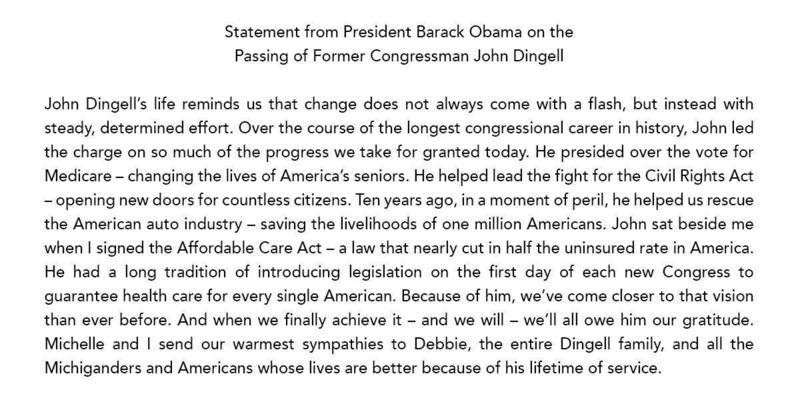 “John Dingell will forever be recognized as one of the most impactful and consequential leaders of our time. John lived every day of his life with clear moral purpose, incredible humor, a strong work ethic and an unwavering devotion to both Michigan and his family. John’s passing is an enormous loss to the nation. 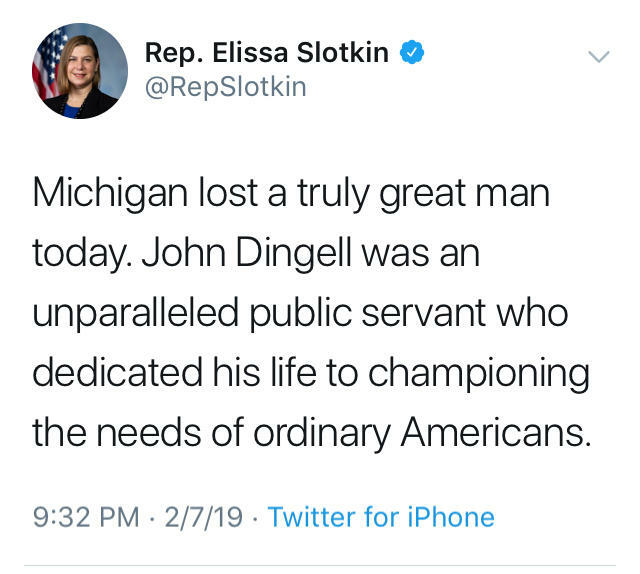 “As a young man, John served our country admirably in World War II and went on to represent Michigan in Congress for over a half century. John’s legacy is unparalleled and unmatched; from the passage of Medicare, to the Endangered Species Act and Clean Water Act, to helping save the U.S. automotive industry during the Great Recession, millions of Americans have a better life today because of John’s work to expand health care access, strengthen organized labor and protect our environment. Ron Bieber, President of the Michigan AFL-CIO also remembered Rep. Dingell fondly. In a statement that reads in part, "From healthcare reform, to environmental protection, to civil rights, to protecting the rights of working families, there was not a major piece of progressive legislation that passed without John having some influence on it. There is no doubt that our country is better off because of the work he did." Condolences also came from across the political aisle. 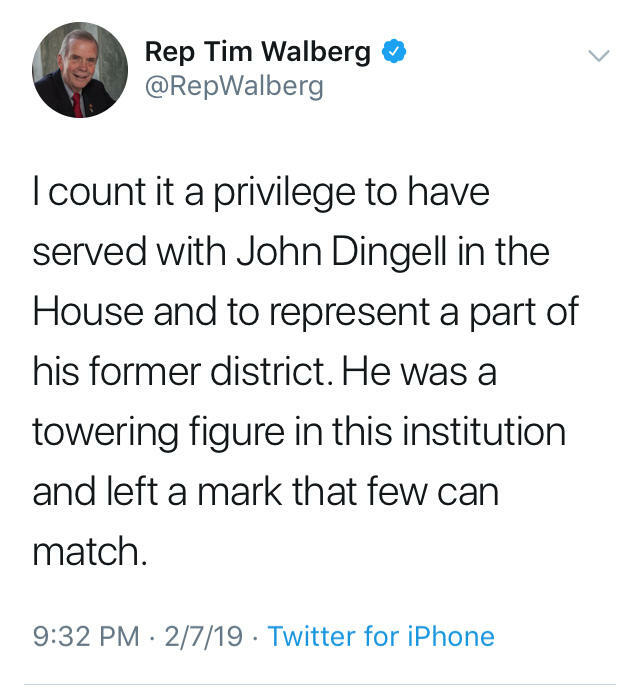 Rep. Tim Walberg (R) of Michigan's 7th Congressional district tweeted, "I count it a privilege to have served with John Dingell in the House and to represent a part of his former district. He was a towering figure in this institution and left a mark that few can match." 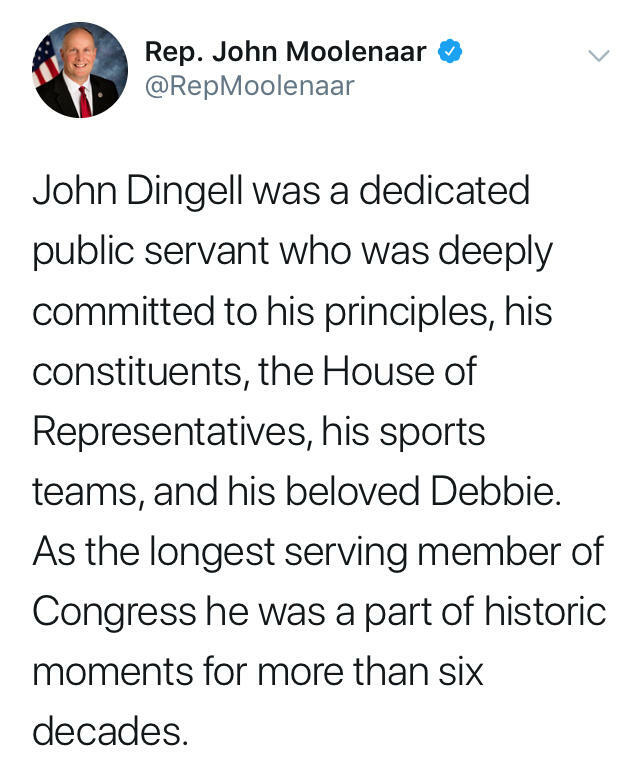 Rep. John Moolenaar (R) of Michigan's 4th Congressional district tweeted, "John Dingell was a dedicated public servant who was deeply committed to his principles, his constituents, the House of Representatives, his sports teams, and his beloved Debbie." Click here to listen to a 2014 WKAR interview with Rep. Dingell before his retirement from Congress. WKAR's Reginald Hardwick reports on reaction to the passing of Rep. John Dingell (D-MI). Former Rep. John Dingell: "You're Not Done With Me Just Yet"
UPDATED 9:15 p.m.: Former Rep. John Dingell, the longest-serving member of Congress in American history, is receiving hospice care, a person familiar with the situation said Wednesday. Former longtime Rep. John Dingell is out of a Detroit-area hospital eight days after suffering a heart attack. Former U.S. Rep. John Dingell has suggested to his followers on Twitter that he may be released from a Detroit-area hospital Tuesday after suffering a heart attack. Former U.S. Rep. John Dingell, the longest-serving member of the House or Senate in U.S. history, is in a Detroit-area hospital after a heart attack.